Thursday July 11 1907 We hurried through the work and went down town at 9.37 after looking around some went over to Otts for dinner Mother was there and Hattie & Uncle Jim in afternoon. I came home at 5.20 and the girls an hour later. We visited till nearly eleven oclock. Friday July 12 1907 We got breakfast over and the girls lunch done up and down town at 9.37. Met some of the friends at the store. From there to the depot. The girls started home at 10.30 and Dorothy went on the same train. Will and I come home on the first car and I got in some dinner. I was over to Mrs. [Kovers?] most of the afternoon Was tired and went to bed early. We made the most of the time which the girls were here. 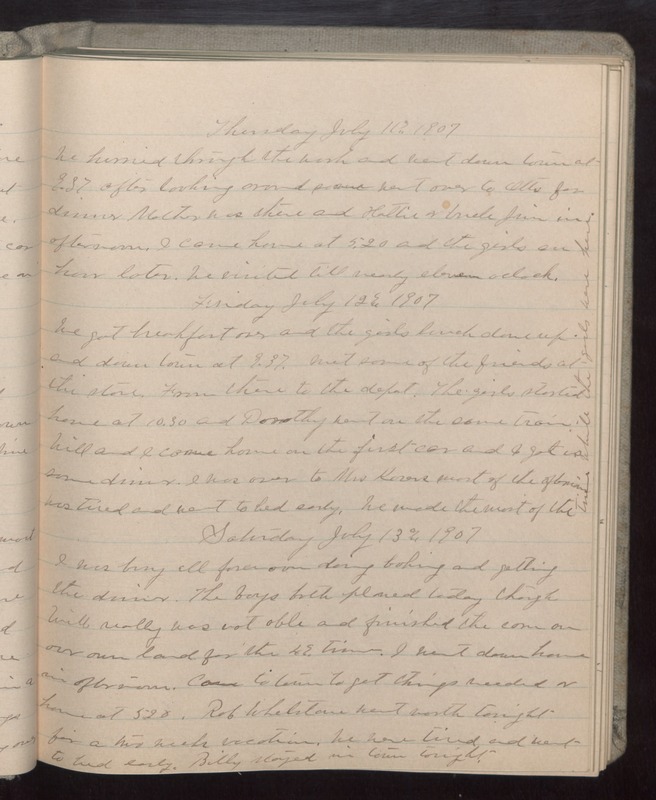 Saturday July 13 1907 I was busy all forenoon doing baking and getting the dinner. The boys both plowed today though Will really was not able and finished the corn on our own land for the 4th time. I went down home in afternoon. Came to town to get things needed & home at 5.20. Rob Whetstone went north tonight for a two week vacation. We were tired and went to bed early. Billy stayed in town tonight.